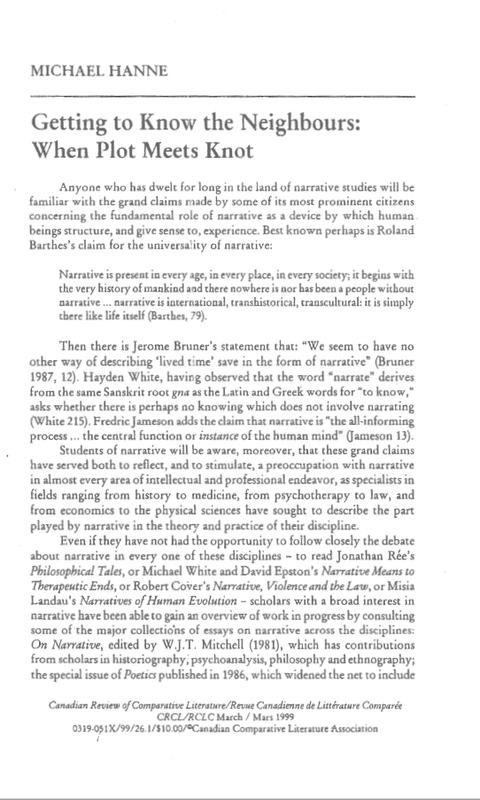 ​‘Narrative and Metaphor across the Disciplines’ was the very successful conference I convened in 1996. It brought over 200 speakers from more than 20 countries to Auckland. To my surprise and delight, there were clusters of contributors from disciplines as diverse as architecture, dance, economics, education, environmental studies, history, indigenous studies, law, literature, media studies, medicine, nursing, organisation theory, philosophy, politics, and psychology. Among the many outstanding contributors to that conference were Ross Chambers (literature), David Epston (narrative therapy), Ted Cohen (philosophy), Mary-Jo Hatch (organization theory), and Peter Műhlhaűsler (linguistics and ecology). Deirdre (formerly Donald) McCloskey (economics) was one of a relatively small number of speakers to focus directly on the intersection of narrative with metaphor. My article, ‘Getting to Know the Neighbours: When Plot Meets Knot,’ Canadian Review of Comparative Literature, March 1999, 26 (1): 35-50, drew on the experience of that conference to explore the complex interactions between narrative and metaphor in politics and literature. I noted that telling a story and coining a new metaphor both involve active interventions in the world. I showed that, in different contexts, a metaphor may generate a distinct narrative, or a narrative may generate a significant metaphor. And I drew attention to the fact that, while fresh narratives and metaphors may be conducive to innovative, creative thinking, it is equally true that some grand narratives and grand metaphors capture broad stretches of discursive territory.